NorthBay Women and Children’s Services Clinical Manager Heather Troutt, R.N., and Shanna Snow, D.O., agree that if a vaginal birth is possible, it’s the healthiest choice for a baby and mother alike. There are a lot of good reasons why moms should strive for a natural birth, without the surgical intervention known as a C-section (aka Cesarean section). Not only do they avoid the risks of surgery, such as bleeding, scarring and infection, but they can begin breastfeeding sooner, and they can go home sooner, too. Babies born vaginally tend to be healthier, too. Fluid is squeezed out of a baby’s lungs during a natural birth, which is a good thing, because they’ll be less likely to suffer respiratory problems. They also receive “good bacteria” from their moms as they travel through the birth canal. That helps boost their immune system. 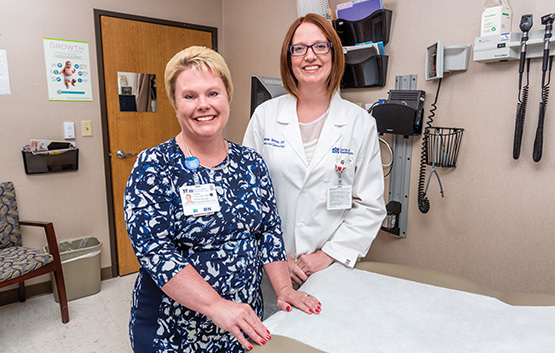 For those reasons and more, NorthBay Healthcare is part of a collaborative of hospitals across the state encouraging women—and doctors—to avoid C-sections when possible. All women of childbearing age should consider taking folic acid 400 mcg daily. If a pregnancy occurs, this can prevent malformations and may reduce miscarriages. Heather Troutt, R.N., clinical manager for NorthBay Women and Children’s Services agrees. In fact, she’s working on her master’s degree through Touro University and her thesis focuses on empowering nurses to use interventions to help moms deliver naturally. NorthBay Medical Center, which has been delivering babies since 1960, is part of the California Maternal Quality Care Collaborative, which includes 69 other hospitals. The focus is on first-time moms, past 37 weeks, because in practice women who have already had C-sections are far more likely to deliver by C-section again. “If we can reduce the number of first-time moms who have C-sections, it will make vaginal births more likely with the next pregnancy,” said Heather. The NorthBay team participates in monthly webinars, and discusses successes, plans and barriers with a physician mentor group. “We’re looking at how we can empower our whole team—including physicians, nurses and support staff—to work together and strive for more safe, vaginal births,” said Heather. In April, NorthBay conducted a skills fair to train staff on how positions affect labor. It has also been incorporated into “Labor of Love” classes, which are offered free for expectant parents who plan to deliver at NorthBay Medical Center. And although high-risk patients are monitored consistently, NorthBay is starting to monitor lower-risk moms on an intermittent basis, which means they can walk around, sit on a birth ball and try different positions to progress their labor. It all improves their chances at avoiding a C-section. Most moms want to deliver naturally, said Dr. Snow. “But you do get a few who request a C-section—usually because they’re afraid they won’t be successful. We use education to reassure them that vaginal birth may be possible. And when they learn it’s best for their baby, that’s really what they want.